Submitted by mahoney on Sat, 01/06/2007 - 6:41pm. These locations are in PR. NOTE.The file now includes all locations in the PANDA FAMILY. In addition to the Panda Express locations, the file now inludes Panda Inn, Hibachi-san and Wasabi file locations. 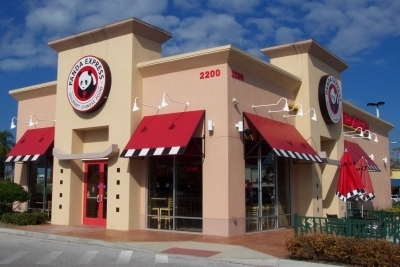 Panda Express is America's largest Asian restaurant chain. These provide quick service Chinese food. The Panda Inn proudly serves Mandarin and Szechwan Cuisine in 5 locations in Southern California (Glendale, La Palma, Ontario, Pasadena and San Diego). Hibachi-San is a Japanese grill aand offers Traditional and Tepanyaki entrees. There are 17 locations throughout the US. The Wasabi offers a Shabu Shabu, a traditional Japanese Hot Pot meal. There is one location in Universal City,CA. Updated Va, Wa, Wi, Wv and Wy. Net increase of 20 locations. Submitted the correct coord for the location in Warsaw,IN. Added 6 more locations in OH and 1 in PA. Submitted a location in Mentor,OH. Updated the file. Added 61 new locations. Updated the file. Net increase of 9 locations. Updated the file. Net increase of 22 locations. Updated the file. Net increase of 14 new locations. Updated the file. Net increase of 11 locations. Updated the file using the latest website locator data.